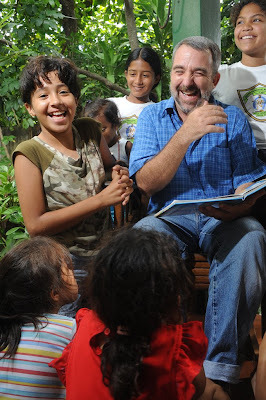 PARTNERS IN MISSION NICARAGUA: Just keep on smiling! I hope this message reaches every one doing well in the midst of all the financial crisis news, painful political campaigning, and other world events which can cause us fear and uncertainty. This picture is during a story telling session with some neighbor kids we do occasionally, along with Birthday celebrations and other after school activities. One thing I have learned from kids and the poor is to JUST KEEP ON SMILING! So, I hope you can too. Our life and work here in Nicaragua is moving forward, little by little. This past weekend Damarys, Chris and I, along with a small group, visited the orphanage and organized activities for about 50 of the 250 kids and teenagers. We plan to organize and work in small groups to teach Music, start a Children's Missionary Movement, work with pre-adolescents and implement the 2009 Catholic Youth Bible Mission. All in all, we had a great Weekend and Christopher did well also. He is a pretty popular baby. Little by little we are also forming a Team, made up of a small group who go with us to the Island and who also help me in the Retreats, Workshops, Talks and other activities I am doing to inspire the youth of Nicaragua in Managua. Last week I completed a Confirmation Course with 40 youth and accompanied them during their Confirmation, it was a beautiful moment and renewed my own faith in the power of the Spirit to assist me in overcoming all the obstacles to becoming a true follower of Jesus Christ and to build up the Kingdom of God. Our faith truly is our greatest treasure. Some times we just are not aware of it or it may need a tune up. The Courses in the High Schools with the Teachers are going well and their is great interest in our work here. It all seems to point to the message of: keeping on with the MISSION! God always sends what is needed, if we have the faith to walk on....to walk on water. Here in Nicaragua, there are allot of tensions and difficulties in the social and political arena. The constantly rising prices of basic food supplies make life very difficult for the vast majority. While the small elites of the Country show little interest in making any real change. There is little dialogue amongst the differing Political and interest groups. All of this combined with the heat...the rainy season ....can some times make it all appear that we are on the road to impending doom. And that is precisely the point where I believe we need to BE AWARE! What is needed in these times is not more people who STOP ACTING, but rather people who fill their minds with FAITH and START ACTING.....GOD WILL SHOW US THE WAY.....THRU THE DESERT AND TO THE PLACE WHERE HE IS LEADING, but is only by ACTING that we will overcome the huge fears of our times. So, let's not let fear run our minds and control our lives.....let's us stand up and ACT on FAITH! Become part of the solution. Yours truly, in Heart of The Lord of all LIFE!